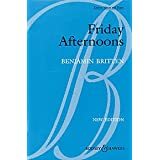 This is the name of a set of 12 songs composed by Benjamin Britten between 1933 and 1935 for the children of a prep school where his brother used to teach. On Friday Afternoons there was a choir, and, judging by the songs, they were pretty good singers. You have to be no mean pianist to manage some of the accompaniments too. Britten’s 100th birthday would have been on 22nd November this year, and there are a number of projects on the go to celebrate it. One revolves around these songs; you can find all about it here: www.fridayafternoonsmusic.co.uk. I strongly recommend the site for downloads, backing tracks, and background information. His arrangement of “Old Abram Brown” is one of the easiest songs to learn and play (although you will need to listen carefully to make sure that the children manage the octave leap to an “E” while still maintaining a good tone and pitch control!). “Cuckoo” is one of my favourites. The songs have also been uploaded onto You-Tube by a Italian choir. This entry was posted in Songs and tagged Benjamin Britten, Friday Afternoons. Bookmark the permalink.